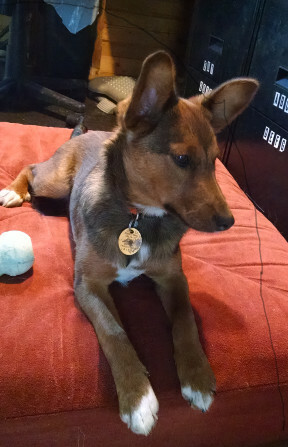 Cedar, I’ve decided, is a smooth-coat Sheltie. Her coloring is certainly a mahogany. The Sheltie “mask” is evident on her face. The white tips and chest blaze finish up the coloration. But there’s no undercoat and, frankly, no overcoat either. And those big bat ears are never going to tip. She’ll be 20 weeks old tomorrow. Cedar will not be rushed into competition. We intend to take it all slow and easy. Most likely she’ll see her first competition in the TDAA where dogs are small and friendly. The important thing about TDAA agility is that it will make her sharp in a way that’s not possible in big dog agility play. Her training foundation will be as complete as we are capable. We’re obviously putting a high premium on independent performance. She’ll be a free spirit in a Velcro world. Right now the emphasis is teaching directional… “Left” and “Right” and “Go On!” We’re also making basic obstacle introductions. Pretty soon I’m going to add the Back Pass to the mix. Though I think I really need to blog up how to teach this skill and why I think it’s going to be an important handling/dog skill over the next decade. You know the old joke that goes “How can you tell when a politician is lying?” Well, these days it’s a bit more complicated than watching to see if their lips move. They’re all getting real clever with language. Do you remember when they foisted the “Patriot Act” on us? That was the legislation that committed us to 12 years of a ridiculous war that cannot be won. There’s never been anything patriotic about the Patriot Act. It’s just a clever bit of language crafted to shame and pressure. Today however we have the unique opportunity to see who is lying to us and, frankly, who is betraying the middle class. Every one of them who is spouting some sound-bite about “We need to restore the 40 hour work week!” … is a liar and a rat fink. You don’t have to go far to see who wants to lie to you and betray you. Flip over to Fox Network. They are fond of liars and promote them at every opportunity. 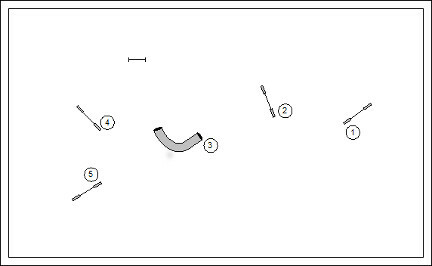 In this sequence the handler probably wants to try to get the dog on his right side on the exit of the tunnel. Without drawing the lines myself I’m trusting that you’ll see that the dog’s path and the handler’s path cross like a scissor cut on the exit of the tunnel. This is a recipe for collision. When I review courses I typically try to discourage this convention. But I’ve noticed in the real world that it occurs often enough. From time to time I’ll intentionally put the rip-saw tunnel into play in my own classes; but not without a discussion about how it should be handled. This is a fun sequence that features no fewer than two ripsaw tunnels. It’s a bit on the technical side; be content that I’m considering this for some USDAA Masters Challenge course down the line. I’m about set for a long road trip. This next weekend I’ll be in Pottstown, IL for a TDAA trial at Dinky Dogs! And then it’s on to Golden, CO for the Western Petit Prix. I’ll do the usual two-day warm-up workshop before the three day event. I’m actually competing with two dogs, Hazard and Haymitch; though I’m not holding out to be terribly competitive on these old creaky knees. I’ll also be bringing along my by Kory. He’s been carrying is rear left leg and so the trip will be nothing but crate rest for him. 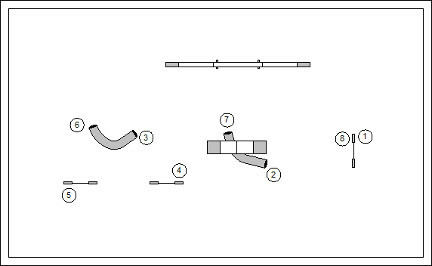 The Petit Prix is about my favorite competition in agility. We don’t have any sudden death events. 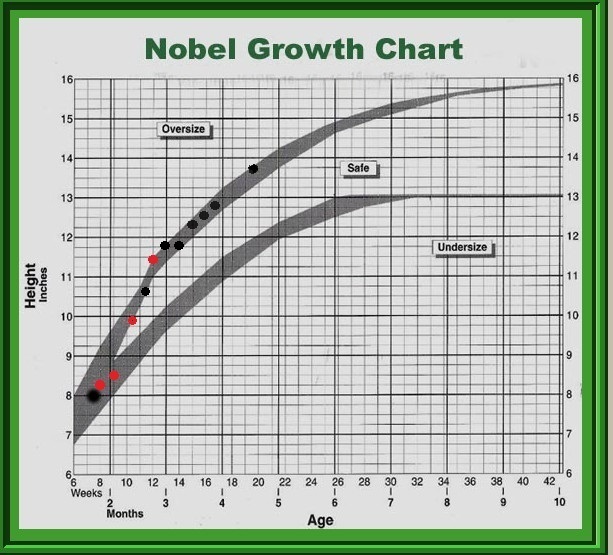 Everybody gets to stay in the game ‘til the very end and will ultimately be measured for placement by overall performance. Some of the finest small dog athletes in the country will be in attendance. It’s like small dog agility heaven. We’ve just arrived in Greensburg, PA for the beginning of a week that will include my favorite agility competition of the year… the TDAA Petit Prix! The tournament features ten rounds of games and courses. There will be no sudden death penalties or dismissing any dog from the competition. In each round every dog will earn a score based on the overall placement against the field. When the dust settles… the dog with the most points wins. Seven games and three standard rounds comprise the competition. I’m thinking that the TDAA has developed the finest games players in the sport of agility. We can play any game imaginable; and we often do. Agility is not just a matter of “follow the numbers”. Anybody can do that. The TDAA challenges our fans with games of strategy and skill, games of cunning and guile, and games of speed. The Petit Prix is the national tournament. It’s the one event every year where the best of small agility dogs get together to compete in a mix of games that test a variety of skills. Obviously, I’m excited by the competition. Tomorrow we start with the warm-up workshop. A few competitors who come early will spend two days training with me in study of the strategies for the games we’ll be playing in the Petit Prix. I hope to share results of the Petit Prix on a daily basis here in my blog. I’m hoping that I have energy and effort to live up to this ambition. I’d very much like to publish or point to YouTube accounts of the competition. So, if you plan to be there… send me something to link! There are four Hobday boxes on this course. It is a course that pretty much NQ’d every dog that is actually faster than the handler. The use of real estate was especially devastating. 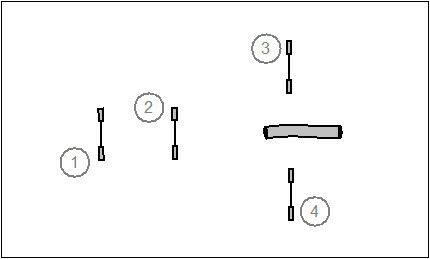 The course runs the handler from corner to corner up the side; then down the side; then diagonal across the field. From a handling POV the handler must have a presence in or near the box to solve. 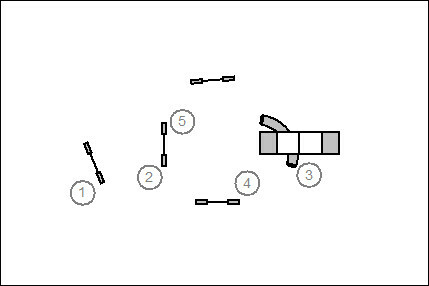 Try solving this kind of thing from 30 ft away (or more) as I have to do with my dog who is faster than I am. The audience was enthusiastic on the rare qualifying run. It’s a fun bunch of people in Western PA. 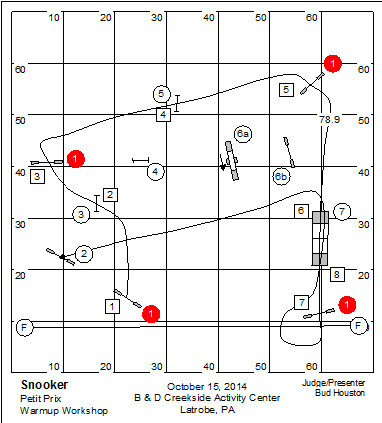 If I were to design such a course for a USDAA Masters Challenge class, I’m sure the course reviewer would ask me to tone it down a bit. Masters Challenge is supposed to be extreme… not crazy. 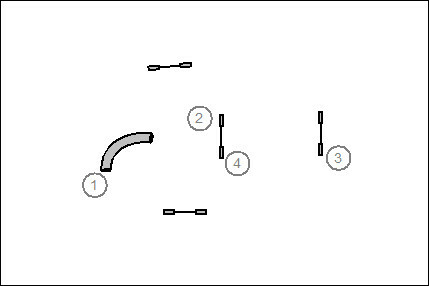 Without doing a blow-by-blow of the course let me illustrate one little moment in the course. 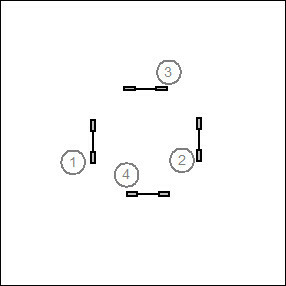 In the dog’s path from jump #7 to jump #8 he is set on a wrong course trajectory to a wrong course at jump #1. In the TDAA, mind you, we require a minimum of 12′ for the handler to solve the wrong course option. 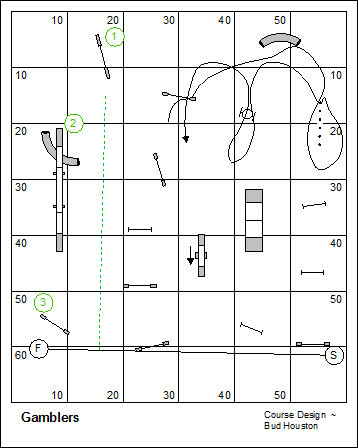 So the spacing to solve the wrong course option on this AKC course is pretty much what we ask for in the TDAA. For big fast dogs, it really should be a minimum of 20′. And this “corner-of-the-box” option is presented like 7 times on this course. Good luck with that. Here’s my run on this course: YouTube. You are currently browsing the archives for the Agility for Small Dogs category.